The economy is heading into a record-breaking expansion with no strong indicators of a recession, yet investors are worried, according to University of Oregon economist Tim Duy. “This last year exceeded what we expected and some unexpected things gave pretty strong tailwinds, such as strong tax policies and spending that we thought would have been more difficult,” said Bruce McCain, chief investment strategist for Key Private Bank. Duy and McCain, who provided the economic review and preview, discussed the nervousness of investors of a pending recession. The panel was moderated by Janet LaBar, president and CEO of Greater Portland Inc.
By looking at reliable indicators, a recession shouldn’t be a complete surprise. Yet, both McCain and Duy see nervousness in the economy. Coming out of the last recessions, companies and investors were less likely to overextend themselves and turned to buying back stock. There are not the “bubble” sectors like the housing and mortgage crisis of a decade ago. Keynote Heather Boushey, executive director and chief economist of the Washington Center for Equitable Growth, talked about the growing divide between the top income earners and everyone else and how that inequality shackles the growth of the economy. One way this affects the economy is through the innovation and consumption of goods towards high-end earners, rather than the middle class. Another is limiting the opportunity for those not already at the top, which slows productivity growth over time. Gregory Acs, vice president of the Income and Benefits Policy Center at the Urban Center, said part of the problem is that those in poverty have less income mobility. Micro Enterprise Services of Portland is helping make a difference to low-income entrepreneurs through small capital loans and business support. Nita Shah, the executive director, talked about the way microfinancing can lift up underserved communities. Their borrowers often couldn’t get financing and would turn to predatory lenders. The default rate at the nonprofit is 1 percent, and the borrowers often receive the support to grow their business and gain the tools to use traditional banks. 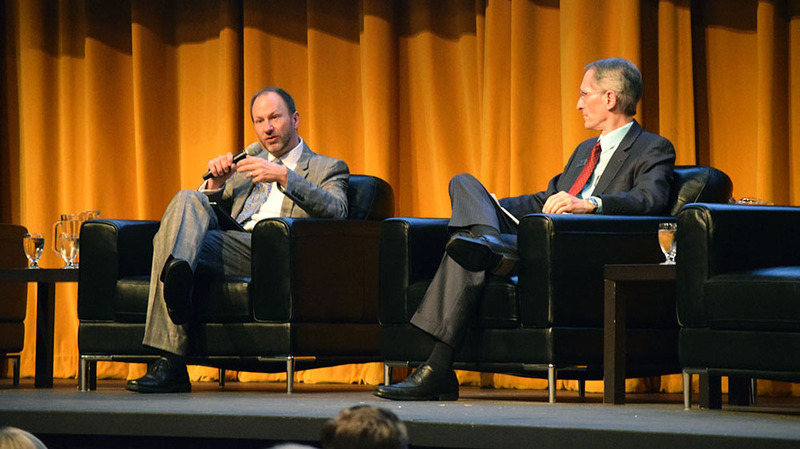 The Oregon Economic Forum is supported by the UO and the College of Arts and Sciences. KeyBank is the presenting partner. Other sponsors are NW Natural, OregonLive, Portland Business Alliance, Port of Portland and Greater Portland.